Today as promised I will show you the items I got from Persunmall in a real outfit! I had so many options with what to style this floral print blouse, but at the end I went for this beautifuk skirt I got from H&M a year ago only for 5 euros! Speak about a bargain! Anyways, now I am off to my summerhouse in Saulkrasti, I have two holidays, in which I plan to be sunbathing a lot, I hope, fingers crossed for good weather, because lately it has been changing a lot from +30C to only +15C! Next Post Persunmall International Giveaway! Gorgeous!! LOVE this outfit especially that skirt! adore that skirt is was MADE FOR U! Estás preciosa con esa falda. that skirt is just pretty as you! had you seen . . .new outfit post click to see >>> Chandelier print dress? The skirt is very nice and it's perfect on you. Great combo. Love this outfit so much! That skirt is such a great shape! Turquoise is such a great colour and it looks great on you. I like the entire outfit. what a fabulous outfit!I like how you styled it! I love this combination and how beautifully your top and skirt compliment each other. Gorgeous! I also can't get over that sparkly cloth – totally my style. Fabulous as always 🙂 Happy July! This outfit is one of my favorites! The colors are too pretty! I was looking foward for this post. You're amazing! Absolutely gorgeous outfit my dear, adore how you styled that amazing shirt! <333 You look too beautiful for words! <33 Bravo, perfect post as always! The blouse and the skirt go so well together! I absolutely love your skirt! The print of your shirt is so pretty too! I would resign from a necklace though. I love your blouse so much ! Love, love, love! That blouse is amazing and love the skirt its so unique! Love this color. Nice combination between the skirt and the flowered shirt 🙂 you look gorgeous!! Wow! an explosion of colours! Love that print! You look super pretty, a bit like Poppy Delevigne! This outfit is gorgeous and fits you flawlessly! I am loving that printed blouse! What a gorgeous outfit. I love that skirt and the colorful blouse is perfect. You look amazing. I absolutely love this look girl!! The colors are so beautiful and you are so gorgeous!! The blouse match perfect with that skirt"
Great skirt and amazing colors. I always Love turquoise in the Summer. You are stunning.! i love the color combination! Waouh you are marvelous in this outfit ! 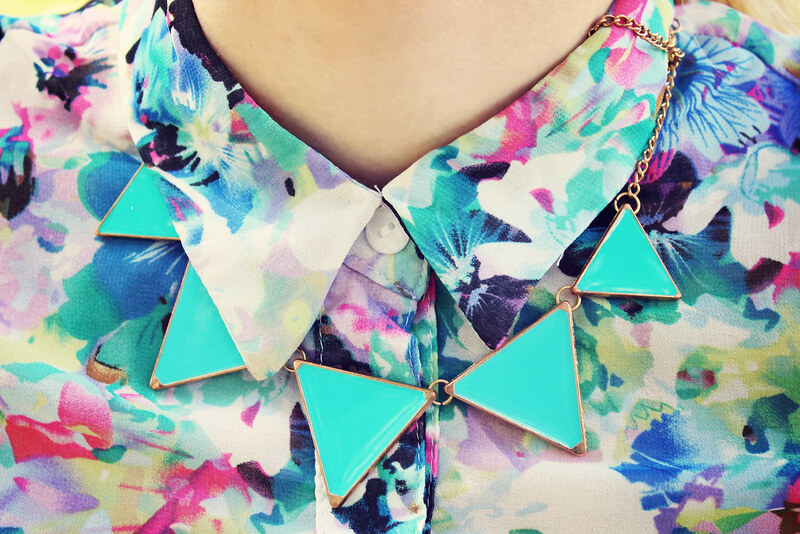 The turquoise fit really well on you ! In love with your skirt ! Love the florals and turquoise, that is a really nice skirt that gives you curves in the right places! 🙂 Pretty! Great look! In love that top! wow ! what a great outfit dear 🙂 Love it a lot !! Absolutely gorgeous outfit! Thanks for inviting me to your giveaway! Gorgeous skirt and so well matched with the floral prints! I just lovey the cut of your skirt ♥ The shirt colors are also amazing ! This look is perfection. The floral top goes beautifully with the skirt. Lovely snaps dear…I love these outfit and great Shoes for Girls !! Simply stunning! Very classy outfit!! i love your whole dress! !